Multiple articles have incorrectly cited bruxism as a reflex chewing activity; bruxism is more accurately classified as a habit. Reflex activities happen reliably in response to a stimulus, without involvement of subconscious brain activity, and bruxism does not. All habitual activities are triggered by one kind of stimulus or another, and that does not make the habit a reflex. Chewing is a complex neuromuscular activity that is controlled by subconscious processes, with higher control by the brain. During sleep, the subconscious processes become active, while the higher control is inactive, resulting in bruxism. Some bruxism activity is rhythmic (like chewing), and some is sustained (clenching). Researchers classify bruxism as "a habitual behavior, and a sleep disorder." The etiology of problematic bruxism is unknown, though several conditions are known to be linked to bruxism. It is theorized that certain medical conditions can trigger bruxism, including digestive ailments and anxiety. Eventually, bruxism shortens and blunts the teeth being ground and may lead to myofascial muscle pain, temporomandibular joint dysfunction and headaches. In severe, chronic cases, it can lead to arthritis of the temporomandibular joints. The jaw clenching that often accompanies bruxism can be an unconscious neuromuscular daytime activity, which should be treated as well, usually through physical therapy (recognition and stress response reduction). Bruxism can sometimes be difficult to diagnose by visual evidence alone, as it is not the only cause of tooth wear. Over-vigorous brushing, abrasives in toothpaste, acidic soft drinks and abrasive foods can also be contributing factors, although each causes characteristic wear patterns that a trained professional can identify. Additionally, the presenting symptoms may be difficult for a physician to attribute to bruxism. The effects of bruxism may be quite advanced before sufferers are aware they brux. Abraded teeth are usually brought to the patient's attention during a routine dental examination. If enough enamel has been abraded, the softer dentin will be exposed, and abrasion will accelerate. This opens the possibility of dental decay and tooth fracture, and in some people, gum recession. Early intervention by a dentist is advisable. The most reliable way to diagnose bruxism is through EMG (electromyographic) measurements. These measurements pick up electrical signals from the chewing muscles (masseter and temporalis). This is the method used in sleep labs. There are three forms of EMG measurement available to consumers for use outside sleep labs. The first is bedside EMG units similar to those used by sleep labs. These units can be purchased for about 2000 and pick up their signals from facial muscles through wires connecting the bedside unit to electrodes that are adhesively attached to the user's face. TENS electrodes or ECG electrodes may be used. The second type of EMG measurement available to consumers is a self-contained EMG measurement headband sold under the trade name SleepGuard, available on loan from some dentists or at a rental rate of 50 per month from the manufacturer. The EMG measurement headband does not require adhesive electrodes or wires attached to the face. While it does not record the exact time, duration, and strength of each clenching incident as the most expensive bedside EMG monitors do, it does record the total number of clenching incidents and the total clenching time each night. These two numbers easily distinguish clenching from rhythmic grinding and allow dentists to quantify severity levels accurately. 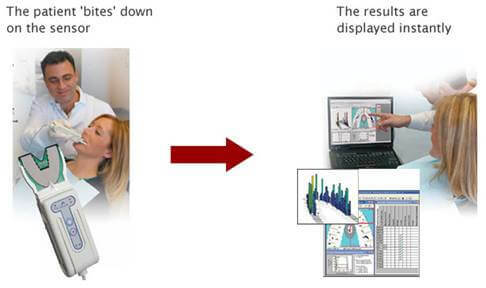 Bedside EMG units and the self-contained EMG measurement headband can both be used either in silent mode as a diagnosis measurement or in biofeedback mode as a treatment. A third method of diagnosis using EMG is available in disposable form under the trade name BiteStrip. The BiteStrip is a self-contained EMG module that adhesively mounts to the side of the face over the masseter muscle. The BiteStrip can only do one night of measurement and does not display the clench count or total clenching time, but rather provides a single-digit display related to bruxism severity. The BiteStrip provides significantly less information than an EMG bedside unit or EMG headband and costs about 60 per day to use. Disturbed sleep patterns and other sleep disorders (obstructive sleep apnea, hypopnea, snoring,moderate daytime sleepiness). Malocclusion, in which the upper and lower teeth occlude in a disharmonic way, e.g., through premature contact of back teeth. High levels of blood alcohol. Drug use, such as SSRIs and stimulants, including methylenedioxymethamphetamine (ecstasy), methylenedioxyamphetamine (MDA), methylphenidate and other amphetamines, including those taken for medical reason. GHB and similar GABA-inducing analogues such as Phenibut, when taken with high frequency. Disorders such as Huntington's and Parkinson's diseases. There is no single accepted cure for bruxism. However, treatments are available. Bruxism may be reduced or even eliminated when the associated factors, e.g., sleep disorders, are treated successfully. Ongoing management of bruxism is based on minimizing the abrasion of tooth surfaces by the wearing of an acrylic dental guard, or splint, designed to the shape of an individual's upper or lower teeth from a bite mold. Mouthguards are obtained through visits to a dentist for measuring, fitting, and ongoing supervision. There are four possible goals of this treatment: constraint of the bruxing pattern such that serious damage to the temporomandibular joints is prevented, stabilization of the occlusion by minimizing the gradual changes to the positions of the teeth that typically occur with bruxism, prevention of tooth damage, and the enabling of a bruxism practitioner to judge in broad terms the extent and patterns of bruxism through examination of the physical indentations on the surface of the splint. A dental guard is typically worn on a long-term basis during every night's sleep. Although mouthguards are a first response to bruxism, they do not in fact help cure it. The NTI-tss device is another option that can be considered. Nociceptors are nerves that sense and respond to pressure. The trigeminal nerve supplies the face and mouth. The NTI appliance fits on top of the teeth and alters the angle at which the jaw opens, by covering only the front teeth and preventing the rear molars from coming into contact, thus limiting the contraction of the temporalis muscle. When the grinding starts in the night the pressure which is applied to the two front teeth can, it is claimed, send quite a strong alarm signal to the brain. The NTI device must be fitted by a dentist. The efficacy of such devices is debated. 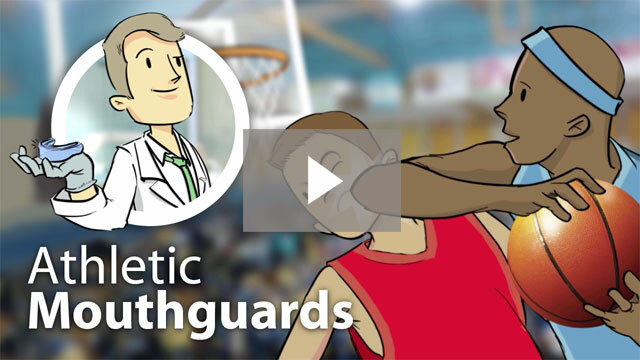 Some writers propose that irreversible complications can result from the long-term use of mouthguards and repositioning splints. Various biofeedback devices are currently available, and effectiveness varies significantly depending on whether the biofeedback is used only during waking hours, or during sleep as well. Many authorities remain unconvinced of the efficacy of daytime-only biofeedback. The efficacy of biofeedback delivered during sleep can depend strongly on daytime training, which is used to establish a Pavlovian response to the biofeedback signal that persists during sleep. The first wearable nighttime bruxism biofeedback device (introduced in 2001), was originally sold under the trademark GrindAlert by BruxCare, and is now sold under the trademark SleepGuard by Holistic Technologies, which owns the patents on the technology. The SleepGuard biofeedback headband is a battery-powered device that sounds a tone against the forehead when it senses EMG (electromyographic) muscle activity in the temporalis muscles. The tone starts out very quiet and then gets louder, allowing people to stop clenching without waking up. This device records and displays nightly data on the number of bruxism events that last for at least two seconds and the total accumulated duration of those events. The volume of the alarm and the bite force required to trigger the device are adjustable. After proper Pavlovian training during waking hours, more than 50% of users achieve significantly reduced bruxism. The biofeedback sound on the headband is designed to come on slowly, allowing users to subconsciously respond in their sleep without waking up. The manufacturer offers a free three-week trial so that only people who find the device works well for them have to pay for it and claims that less than 15% of trial units are returned. A mild electric shock bio-feedback device for treating Bruxism, GrindCare, has been approved by the European regulatory authorities and was introduced to the market in 2Q2008 - and was approved by FDA Authorities in the US in early 2010. The device works by using simple electrodes mounted on the skin close to the cheek bones prior to sleeping; it detects the initial muscular contractions and immediately provides mild electrical shock pulses to the facial muscles. The electric shocks serve to interrupt bruxism activity. The device is worn on the head and reportedly reduces grinding, usually without interfering with the sleep of the patient as described by Jadidi, Castrillon & Svensson. Thereby facial tension, joint defects and teeth disruption are reportedly reduced. One bruxism biofeedback device which was briefly on the market but is no longer available was sold under the trademark Oralsensor. This device consisted of a pneumatic pouch embedded in a soft polymer plate that fits over upper or lower teeth. When the teeth came together with a force that exceeded a set threshold, an alarm is sounded in an earpiece worn by the user; the device is no longer sold. In 2005, a new type of occlusive device was patented that produces a movement incompatible with teeth clenching. When nighttime bruxism occurs, people breathe through the nose. The device forces people to breathe through the mouth; by forcing the opening of the mouth, the device is claimed to stop clenching. The occlusive device has an electromyogram system that monitors the electric activity of the jaw muscle via wireless electrodes. These electrodes transfer jaw-muscle activity by radio frequency to an external monitoring system. Once the signal has been interpreted by the monitoring system, if a person clenches, the monitoring unit sends a radio frequency signal to a transceiver integrated in a mechanical actuator. The mechanical actuator has two occlusive flaps that block the nostrils, forcing breathing to occur through the mouth. Once the patient stops clenching, the flaps open, allowing breathing through the nose again. The occlusive device does not wake up people since it blocks nostrils slowly, and it never closes them completely to avoid sleep disruption. Botulinum toxin (Botox) can be successful in lessening effects of bruxism, though serious side-effects are possible. Less than one microgram ingested or inhaled is sufficient to kill an adult human. In extremely dilute form (Botox), this toxin is used as an injectable medication that weakens (partially paralyzes) muscles and has been used extensively in cosmetic procedures to relax the muscles of the face and decrease the appearance of wrinkles. In April, 2008, a study was published in the Journal of Neuroscience that showed that facially injected Botox can and does propagate into the brains of some test animals, and the U.S. Food and Drug Administration (FDA) announced that it was beginning a safety review of Botox and other similar drugs. Botox was not originally developed for cosmetic use. It was, and continues to be, used to treat diseases of muscle spasticity such as blepharospasm (eyelid spasm), strabismus (crossed eyes) and torticollis (wry neck). Bruxism can also be regarded as a disorder of repetitive, unconscious contraction of the masseter muscle (the large muscle that moves the jaw). In the treatment of bruxism, Botox works to weaken the muscle enough to reduce the effects of grinding and clenching, but not so much as to prevent proper use of the muscle. The strength of Botox is that the medication goes into the muscle and is not supposed to get absorbed into the body (though the new research shows it does). The procedure involves about five or six simple, relatively painless injections into the masseter muscle. It takes a few minutes per side, and the patient starts feeling the effects the next day. Occasionally, some bruising can occur, but this is quite rare. Injections must be repeated more than once per year, and the risk factor of spread of the botulinum toxin is compounded by this repetition. The optimal dose of Botox must be determined for each person as some people have stronger muscles that need more Botox. This is done over a few touch-up visits with the physician injector. This treatment is expensive, but sometimes Botox treatment of bruxism can be billed to medical insurance. The effects last for about three months. The muscles do atrophy, however, so after a few rounds of treatment, it is usually possible either to decrease the dose or increase the interval between treatments. Other authorities caution that Botox should only be used for temporary relief for severe cases and should be followed by diagnosis and treatment to prevent future bruxism or jaw clenching, suggesting that prolonged use of Botox can lead to permanent damage to the jaw muscle. There is anecdotal evidence that suggests taking certain combinations of dietary supplements may alleviate bruxism; pantothenic acid, magnesium, and calcium are mentioned on dietary supplement websites. Calcium is known to be a treatment for gastric problems, and gastric problems such as acid reflux are known to increase bruxism. Why is it important to measure the force of a bite? It is often the case that these problems arise from what is called the 'maloccusion' of your bite. This means your bite is unbalanced and extra stress is put on the surrounding muscles of your mouth. It is really simple - all the patient has to do is bite down on an ultra-thin sensor. The software renders a dynamic analysis of your bite on the computer which enables us to identify contact points on individual teeth and the relationship to all other tooth contacts. A balance indicator guides adjustments using simple, understandable graphic displays. The results can be combined with periodontal charting, X-ray and tissue exam data to provide a complete assesment of your oral health. Using the T-scan technology, we are able to instantly assess the orgin of the headaches or pain and then recommend a course of treatment for you. 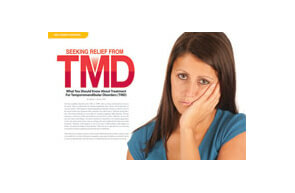 Treatments may include an NTI appliance or a night time acrylic splint. You may also require other dental work in order to re-establish your bite. The letters TMJ are short for of temporo-mandibular joint, which is the joint connecting your lower jaw and your skull. The movement in this joint lets you open and close your mouth and chew from side to side. If your teeth dont fit together properly, you can have problems not only in your teeth themselves, but also the gums, the temporo-mandibular joint or the muscles that move your jaw. These problems are called occlusal problems. You may find that you clench or grind your teeth, although most people who do aren't aware of it. Sometimes can be caused by anxiety, but generally most people clench their teeth when they are concentrating on a task - housework, gardening, car mechanics, typing and so on. 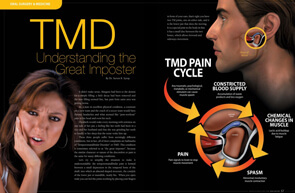 Together, all these symptoms are called TMJ syndrome.